Transform walls into a whimsical forest scene with the cutest Woodland Creatures Peel and Stick Wall Decals by Veronique Petit. Color your world with plush unique woodland forest and friends from RoomMates Designer Decor Peel & Stick line. 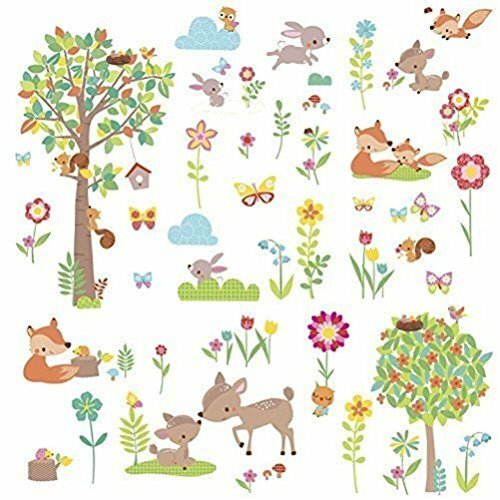 Featuring adorable baby hedgehogs, prancing deer, joyful bunny rabbits, lively little foxes, and more, 39 wall stickers are included in this truly affordable pack! Let your walls sing with joy as you peel, stick, remove, and reposition each furry woodland creature, colorful flowers and bright tree. Get ready for endless fun as you rearrange each wall sticker as often as you'd like without lessening the quality. If you have any questions about this product by Defonia, contact us by completing and submitting the form below. If you are looking for a specif part number, please include it with your message.